My best girlfriend came to visit and I decided that she needed to be a Guinea Pig! Fortunately, it was a mostly pleasant experience! Her first morning here, I decided to try out an idea that had been fluttering around my busy brain, the breakfast salad! I have been wanting a healthy option for breakfast that was not boring or cliche. This definitely fit the bill. I thoroughly enjoyed this meal and will be making it again. My friend is doing a fitness challenge called the 21 Day Fix and she did the math and found that this meal fit perfectly into her meal plan with two exceptions, she would use turkey bacon and would have two eggs! So, turkey would be the healthier option, but even with my regular bacon we came in at a very modest 175 calories, 245 if you have two eggs. One ended up being plenty for us that morning but two poached eggs fits perfectly fine in the healthy breakfast range if you need it. Speaking of eggs, it’s always a treat when Wendy comes to visit. Not just because I love her and her children, but in this case, because she always brings fresh eggs from her mama’s chickens! This trip she brought three dozen and we ripped right through ’em! Next time, I’ll take an even five dozen, Wen. These are happy eggs! They are beautiful in color both inside and out. 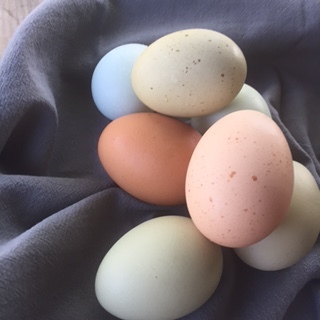 Starting with the shells, there are freckle like speckles on cream colored eggs, pale blue eggs, rich brown, dusty green and gorgeous mocha colored shells. The yolks, though! They scream happy chicken! They are an almost unreal golden orange in color. If you crack one open next to a regular old store bought egg, the pale yellow of your yolk will shock you! I hope you will try to find a local source for eggs at least once to see the difference for yourself. You might be surprised at the comparable price and exemplary quality. Thick cut bacon lardons, cooked crisp and drained on a paper towel. One slice per salad. Add all ingredients to a mason jar and shake vigorously until combined. Makes enough for four salads. You can do this one of two ways. Either put all items out together and let folk build their own salads or plate them individually. Start with your arugula, place a thick slice of tomato on top of it. Add your perfectly poached egg (see poaching tips and tricks below), spoon your dressing directly onto egg letting it slide over it and onto the ingredients below. 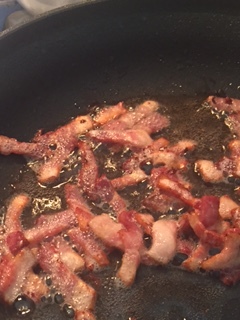 Last, sprinkle your bacon lardons (short thin strips of crisped bacon) over the top. Serve immediately. 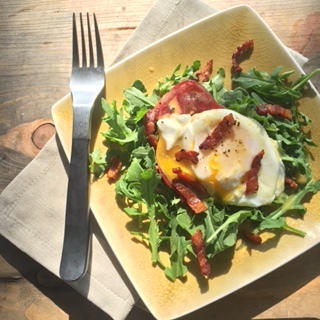 Once you cut into your egg, the rich yolk will meld with the mustard vinaigrette to create the perfect sauce for this amazing breakfast salad. 1. A couple table spoons vinegar in the water will help keep the whites for “spidering out” too much. 2. Water temp is important. If you lower your egg into water that isn’t boiling, it will spread too quickly and you’ll be left with a stringy, nondescript mess! 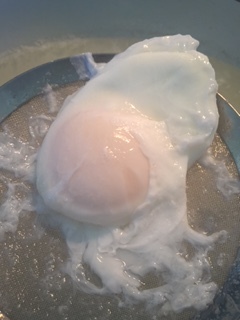 Additionally, if your water is boiling too hard, you will have a hard time maintaining control of your egg. Keep it at a nice steady slow boil and only poach an egg or two at a time. 3. Use a mesh sieve or slotted spoon to gently lower your egg into the water. 4. Take care not to over cook. The egg should be slightly jiggly indicating a rich and runny yolk. I can’t impart how much I enjoyed this meal. It will be a regular “go to” in my house from now on! Bon appetit! Previous Post Sweet Summer Centerpiece: A table scape too easy not to do!